Sherry Liu creates ceramics, paintings and textiles inspired by her relationships with those around her. Liu is interested in expressing inner feelings and moments of awakening mixed with stories from her imagination. Her works are invested with personal symbolism imbued in images, language and used materials she collects from different countries. 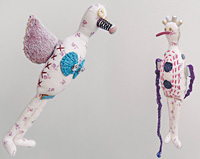 Image: Sherry Liu, Fabric birds (detail) 2010, mixed media. Courtesy of the artist.